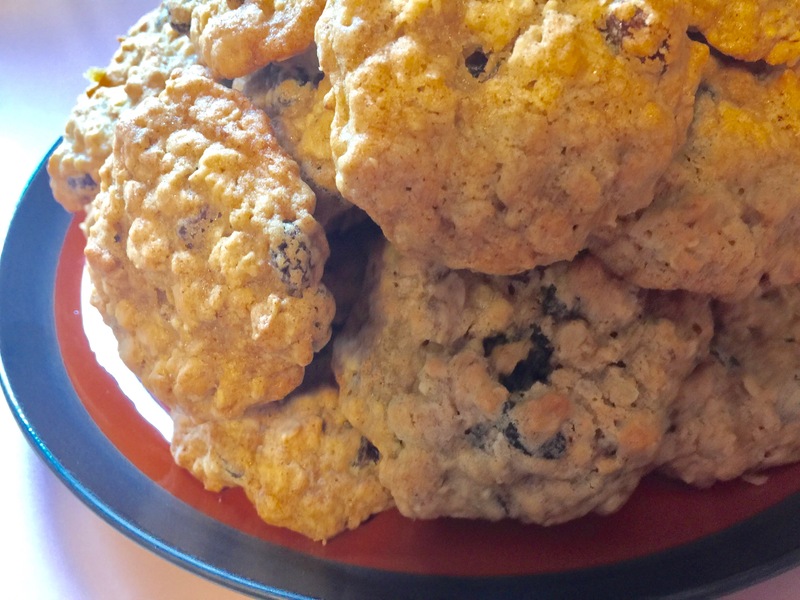 Oatmeal raisin are my favorite, as well as my boyfriend Jason’s favorite, kind of cookies. They are a solid choice if you have to bring a dessert to an event where anyone can’t eat (or for some strange reason doesn’t like) chocolate. There are thousands of recipes for oatmeal raisin cookies, but I like this one in particular because the cookies come out chewy on the inside and slightly crunchy on the outside. They are sweet, but not overbearingly so. In addition, they are quick to make and most of the ingredients are things you probably already have in you cupboard. In large bowl, cream together butter, white sugar, and brown sugar until smooth. Beat in the eggs and vanilla until fluffy. Stir together flour, baking soda, cinnamon, and salt. Gradually beat into butter mixture. Stir in oats and raisins. 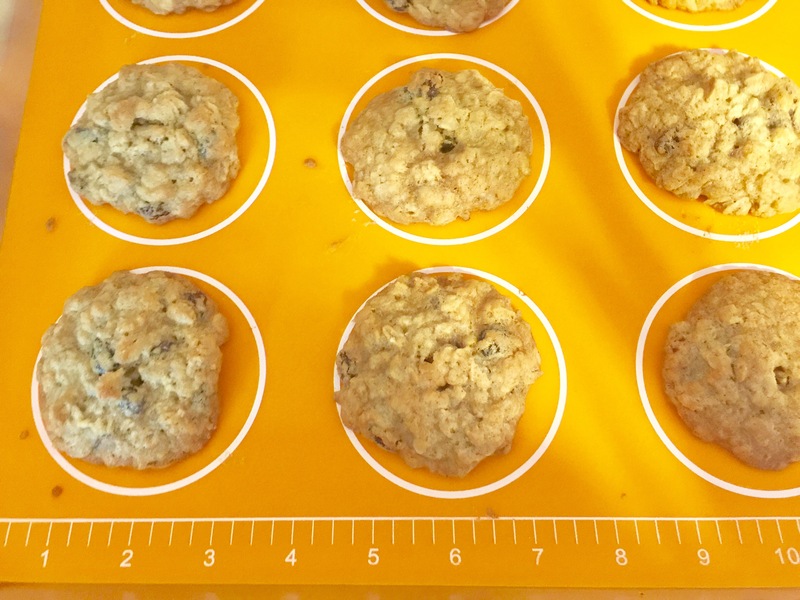 Drop by teaspoonfuls onto ungreased cookie sheets. Use a silicone mat as pictured above to make clean-up easy and prevent the cookies from sticking to the baking sheet. A traditional Italian entree, eggplant parmasan is one of my favorite meals. I was inspired to learn how to cook it when I first started dating my boyfriend Jason who is part-Italian and may like eggplant even more than I do. We often order eggplant parmasan when we go out to eat as well, so this dish has become a culinary theme in our relationship. 🙂 My BFF and former roommate Michelle taught me how to make it and her version beats many I have tasted in fancy restaurants. The proportions below are for a casserole. If preparing one or two servings, I recommend using a small serving dish for each and cutting the ingredients in half. While this does take a long time and is very messy, it’s totally worth it! Serve with pasta and/or a green salad. Slice eggplants horizontally into very thin slices and lay the slices side-by-side on a cutting board. Sprinkle salt on both sides of each slice and allow to sit for at least 10 minutes. Remove salt with paper towels. (The salt soaks the water out of the eggplant so that it doesn’t get soggy when you fry it later). 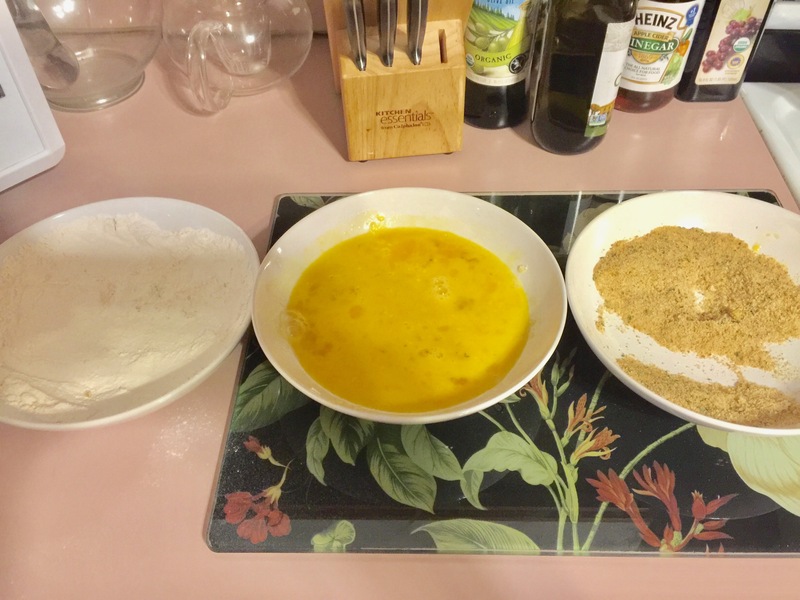 In 3 separate bowls, place flour, beaten eggs (start with 3) and breadcrumbs. You will coat each slice of eggplant with these ingredients in turn. Coat the first slice of eggplant in flour, then egg, and then breadcrumbs. Make sure you completely cover every corner of the eggplant. 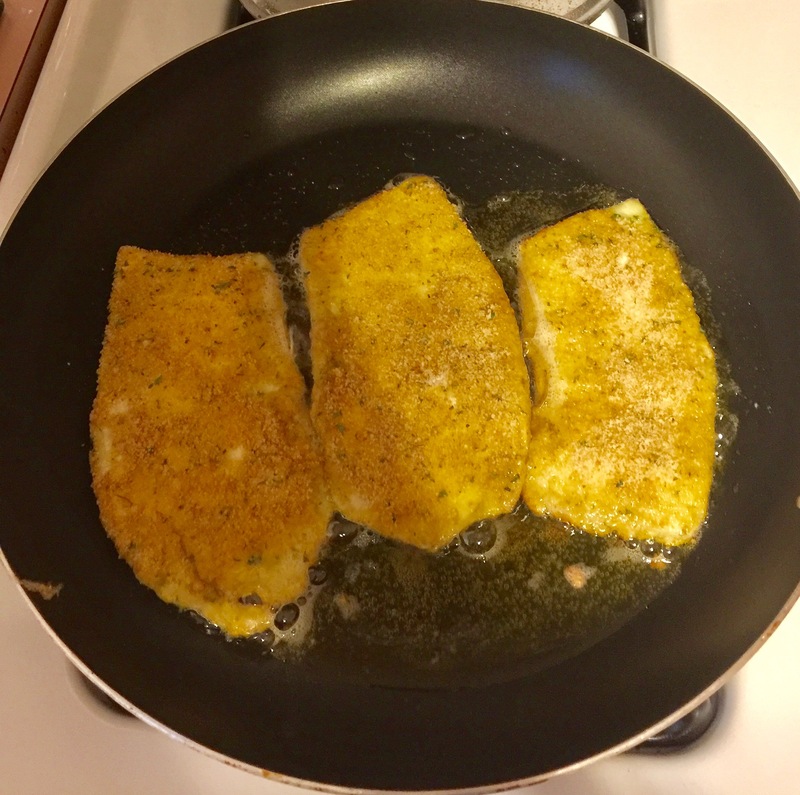 Place in a pan with olive oil and fry until each side is golden brown. (About 3-4 minutes per side). Repeat for each slice of eggplant. Depending on the size of your pan, you can probably fry up to 4 slices at once. Leave at least 1/2 inch between slices and move them toward the center of the pan so that they cook evenly. As you finish frying the first few slices, begin layering them with marinara sauce and cheese in a casserole size (9×13 inch) baking pan. Begin by coating the bottom of the pan with marinara sauce, then place a layer of eggplant slices and cover with cheese. Repeat until the pan is full. Your top layer should be marinara sauce covered with cheese. Cover the top layer of mozarella with freshly shaved parmasan cheese. Bake at 350 degrees for 30 minutes or until bubbly and the top layer is golden brown. Allow to cool before slicing and serving. (Otherwise it will be runny). 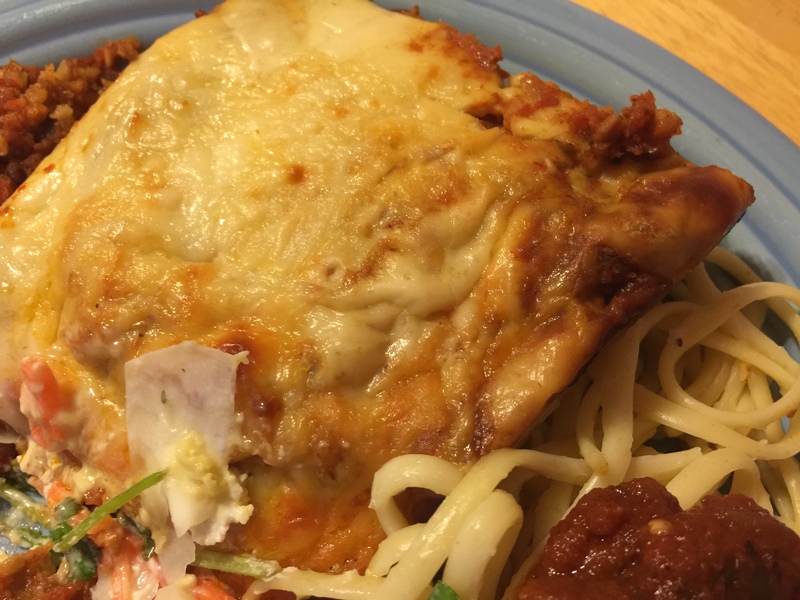 The name of this recipe is deceptive because many eggplant parmasan recipes do not actually contain parmasan cheese, only mozzarella. My recipe is unique because I add freshly shaved paramsan on top of the casserole before baking it. Blueberry is my boyfriend Jason’s favorite pie, so I dedicate this recipe to him. The lattice crust adds an attractive flair and the lemon juice complements the fruit so that the pie is slightly tart and not too sweet. I also add lemon zest to enhance the citrus flavor. I suggest making this pie in July through early September when blueberries are in season. Be sure to use fresh blueberries. (Maine blueberries are best if you can find them). Unfold first pie crust and press into pie dish. Place blueberries in strainer and rinse. Drain berries and add to large bowl. Add flour and toss to coat. Add sugar, lemon juice, zest and salt. Pour berries into pie shell. Cut other pie crust into 1 ” strips. Place strips on top of crust in criss-cross pattern to form a lattice. Bake for 45 – 60 minutes or until bubbly. Serve. Place the pie on a foil-lined cookie sheet to catch any drippings from the pie while it cooks. Place strips of aluminum foil around the edges of the pie crust while baking to prevent it from burning. When checking the doneness of the filling, insert a knife into the center of the pie. If there is little or no resistance, the pie is done. If the pie comes out runny, pop it in the refrigerator overnight or in the freezer for about 15 minutes to allow the ingredients to solidify. I typically bring Strawberry Rhubarb Pie to summer gatherings, so when I couldn’t find rhubarb in my local supermarket I was in a bind. 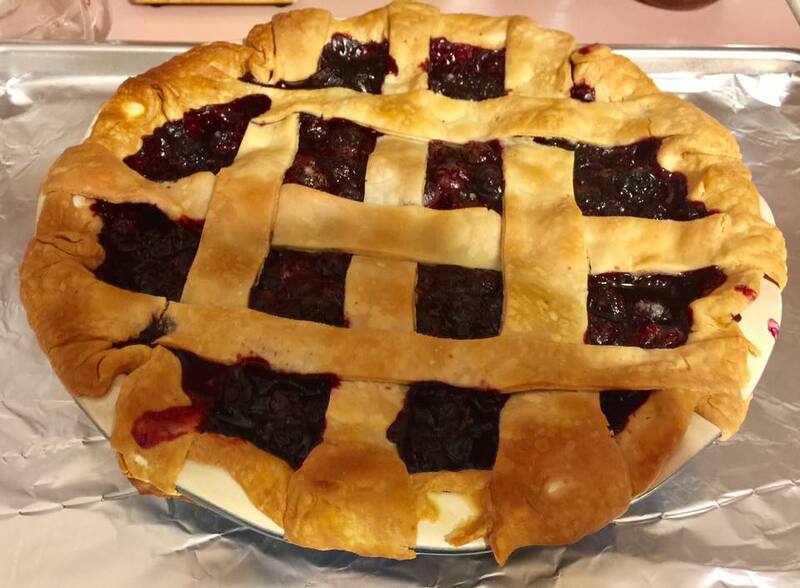 My friend Cecilia had requested a fruit pie for her picnic, so I googled “berry pie” and found this five star recipe from the Food Network. I ended up with enough filling for two pies, so I’ve cut the ingredients in half below. I also added the zest of half a lemon, which contributes a pleasant tangy flavor to counteract the sweetness of the berries and sugar. This may be my new favorite summer pie! Combine sugar, flour and cinnamon. Stir with a fork. Place 1 crust into the pie pan. Spread 1/3 of the sugar mixture on the bottom and add fruit. Sprinkle lemon zest evenly on top of fruit mixture. Top the mixed berries with the rest of the sugar mixture. Place the top crust on the pie and gently press the top crust to the bottom. Trim with a knife and roll under. Press together with your thumb and forefinger to make a scalloped edge. With the knife, place 8 1/2 slits on the top of the pie. 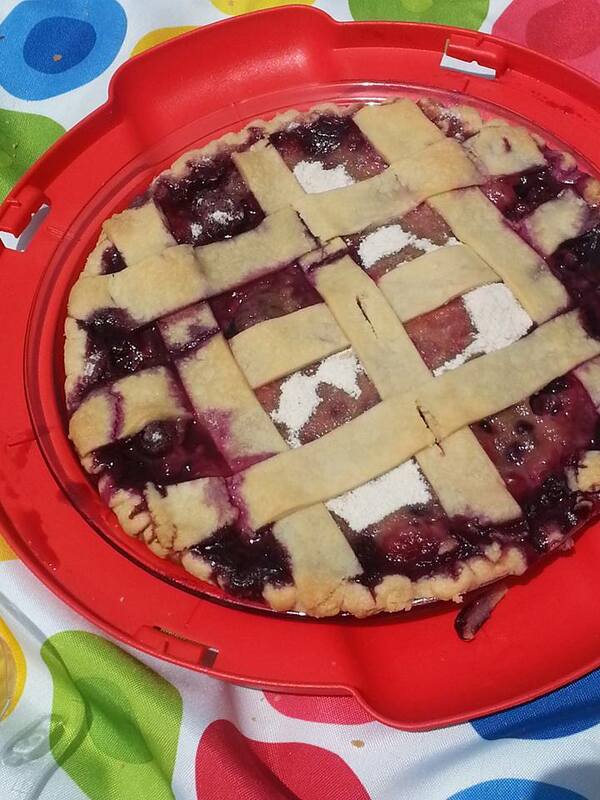 Alternately, you may make a lattice crust as pictured to the right, by flattening the top crust with a rolling pin and slicing it into strips which you criss-cross over each other on top of the fruit filling. Bake for 45 minutes. When checking the doneness of the filling, insert a knife into the center of the pie. If there is little or no resistance, the pie is done. My friend Debi makes this delicious soup for her family and often brings it to parties. One of the best things about Gypsy Soup is that it is gluten-free, dairy-free and vegetarian, so it may be enjoyed by people with a variety of dietary restrictions. Most importantly, it’s full of flavor and perfect for a cold winter evening. 1 tbs tamari sauce (Gluten-free individuals may leave out the tamari or use a gluten-free brand). If using raw chickpeas, begin soaking 3/4 cup at least 3 1/2 hours before making the soup, and allow 1 1/2 hours for them to cook. If you are short on time, canned chickpeas work too. 3 cups stock or water (Debi always uses stock, but boxed organic vegetable broth is fine). In a soup kettle or large saucepan saute onions, garlic, celery and sweet potatoes in olive oil for about 5 minutes. Add seasonings (except tamari sauce) and the stock or water. Add remaining vegetables and chickpeas. Simmer another 10 minutes or so-until veggies are as tender as you like them. In an effort to get more vegetables in my diet, I started making breakfast smoothies with spinach and kale. Unfortunately, they tasted like cardboard and were barely palatable. Then, I remembered that Dad makes himself a healthy smoothie every morning, so I asked him what he puts in it. When I made this smoothie at home, it was delicious! The orange juice masks the bitter taste of the kale. This is a perfect smoothie to drink for breakfast because the protein will stave off your hunger until lunch time, preventing you from binge eating later in the day. Pour orange juice into blender. Add other ingredients, blending as you go. 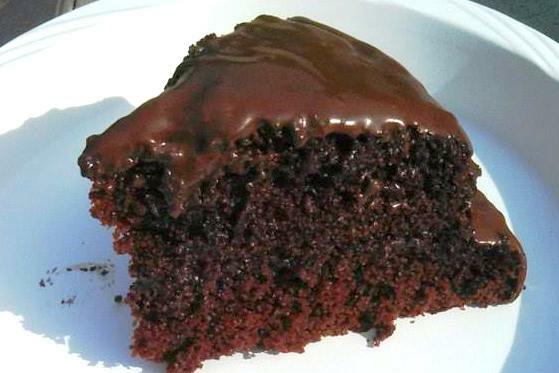 If you are going to throw your diet out the window, this chocolate cake is worth the calories. The cake is unbelievably moist, almost to the point of having a fudge-like consistency. The best part is that it’s very simple to make- almost as easy as using a mix (but, that would truly be sinful)! 🙂 I baked this cake for an alumnae function and it was quickly devoured. One reviewer of the original AllRecipes.com recipe commented that the same recipe is on the back of the Hershey’s cocoa box. Regardless of where it came from, it’s amazing! Never again will I use another chocolate cake recipe. This one is staying for good. The frosting recipe is courtesy of another reviewer of the cake recipe on AllRecipes.com. Preheat oven to 350 degrees. Grease and flour two nine inch round pans. Add the wet ingredients. Mix for 2 minutes on medium speed of mixer. Stir in the boiling water last. Batter will be thin. (Do not worry about the thin batter- this is what makes the cake so moist)! Melt butter and stir in cocoa. Alternately add sugar and milk, beating to spreading consistency. If necessary, thin with additional milk.